Robin of Sherwood is a 5 reels and 243 paylines video slot game developed by Microgaming software platform. You know that Microgaming is the largest e-gaming casino software provider which has developed thousands of best online slots for online casinos. Robin of Sherwood is one of the latest slot game developed by Microgaming. The game has everything that an online slot lover might need. 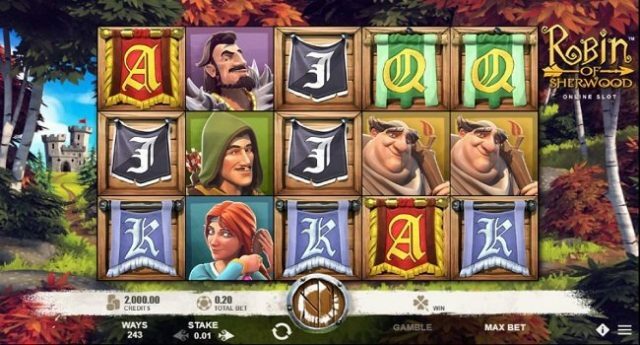 You will find wild symbols, scatters, bonus symbols, free spin feature, auto play option and many more things here in this Robin of Sherwood slot machine. You can bet with just as little as £0.20 per spin to up to £40 per spin. The game offers a jackpot 50 times of your total stake. Return of player percentage for the slot is 95.86%, which is very nice. There is free spin bonus feature available in this game which can offer you 10 free spins. Robin of Sherwood slot can be played using desktop, laptop, tablets and mobile at any Microgaming online casinos listed here at top10casinoreviews.com. This slot is simply awesome. This slot is made on a story about Robin Hood who robs from the rich man and gives to poor people. The reels of this game contain symbols like J, Q, K, Robin itself, the dastardly Sheriff of Nottingham, Maid Marion and Little John and Friar Tuck. The Robin itself is the highest paying symbols which can give you 50 times of your total stake if you land 5 of these symbols across a payline. The ‘arrows’ are the wild symbol and thye can replace all other symbols except the target scatter icons. If you land 3 or more of the target scatters on a payline, you will trigger free spin feature and then 10 free spins will be added to your players account. By the way this feature can’t be retriggered. The game features a ‘gamble feature’. If you want to double your winning amount by selecting either the green or red target for Robin to hit then you can use this feature. But the wrong answer will lose it all. I think you should not go for this feature.